when painting your house exterior: should you hand-brush the paint or spray it on and how much should you use? Determining quantity is no minor issue if you are purchasing high-quality, expensive paint. Throughout an entire house, it can make several hundred dollars' difference. 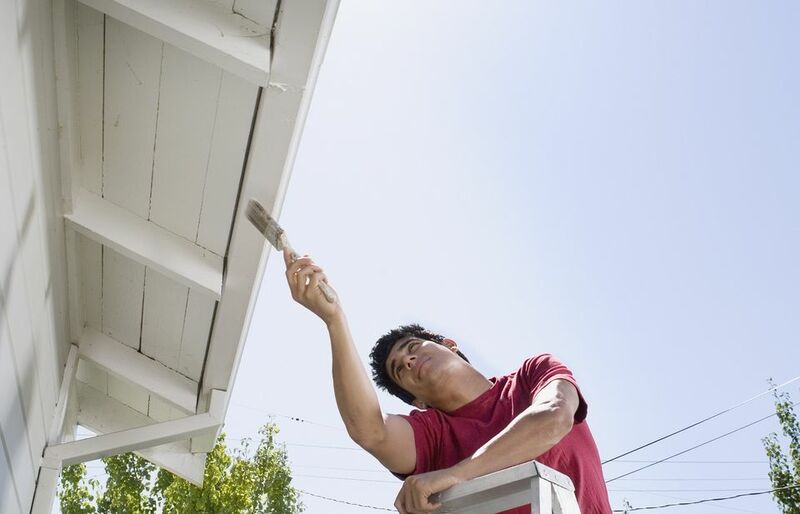 Brushing: Many homeowners brush paint on their house exterior. Brushing affords you quicker start time, far less masking, more attention to details, thicker coat, and less paint used per square foot. But brushing is more physically demanding than spraying, a challenge many homeowners are not up to. Spraying: Spraying your exterior means you can cover tricky obstructions from utilities (wires, pipes, gas meters) and architectural details. Once you have everything masked and taped-up, spraying is faster than brushing. But ​the cover-up is a killer, as everything within the range of several feet must be covered. In general, you will use up to three times more paint by spraying than by brushing–plus, you risk getting a thinner coat. Spraying uses more paint because the sprayer atomizes the paint into tiny droplets. Most of the droplets end up on the surface, but many others drift away. This is inherent with paint spraying, and little can be done to control it. Also, paint left in the tubing must be blown out. Some can be saved, but much of it goes to waste. Brushing: 1 gallon per 400 square feet, and even more. One gallon of exterior acrylic-latex on a clean, painted or primed surface–a minimum of porosity–is estimated by manufacturers to cover about 400 square feet. Through personal experience, we have found this to be largely true. If anything, it is possible to squeeze out even more square footage per gallon by brushing on–up to 450 square feet. Dripping and laying on the paint too thick are the only factors that will bring down this estimate. Spraying: 1 gallon per 150-200 square feet. The same amount of paint will cover about 150 to 200 square feet of wall. We would be more careful and even estimate more like a 1:3 ratio (1 gallon brushed on will require 3 gallons when sprayed on). Avoid Wind: Even a mild, 5 mph wind is enough to blow away sprayed paint. Truly windy days can increase your paint consumption by as much as 50%. Pump Paint Back: When you are finished, it is tempting to spray out the rest of the paint into the air. Instead, pump paint remaining in the hose back into the can instead of disposing of it. Paint residing in even 25' of hose can add up. Stand Closer To Surface: The farther away from the surface you are, the more paint drifts away as a cloud. Standing closer to the surface reduces this paint-cloud. But be careful: spraying closer means a greater chance of drips. Also, you get more blow-back from the sprayer, which means suiting up with a painted sock, coveralls, respirator, and goggles.